With my premise of what to expect at the ASG (a 'success' if only 2 people show up and have fun), we far exceeded expectations. These SMiLE/Beach Boys fans are a prompt bunch, with just about everyone arriving precisely at 1 p.m. sharp! It was great talking face-to-face to people about SMiLE, instead of via computer. And it was cool to find so many in the Atlanta area including: (list names here). Basically, the ASG amounted to everybody talking about SMiLE for about 3 hours. Sure, we played the music of SMiLE and watched videos, but the main emphasis seemed to be on SMiLE-related chat. Ray did bring a batch of CDR's, which played continuously through the event (save for the viewing of the video). One of the CD's that he brought had a recent live version of "Surf's Up" featuring Brian and the Wondermints (I believe Ray say it was from a Japanese show). It was simply phenomenal to hear this song and it was a great preview of what to expect from a (hopefully U.S.) SMiLE tour! What did we talk about? The MAIN topic of conversation was: would SMiLE would be released in 2004 and if so, then what format? While some opted for the box set release, others guessed that the official 'release' of SMiLE would consist simple of a live CD version of SMiLE, like Brian did for Pet Sounds. The majority seemed to agree that this would be the most realistic 'release' of SmiLE because a live release (on Sanctuary Records NOT Capitol Records) would take Mike Love and Al Jardine out of the equation and avoid the problems that help up the Pet Sounds Sessions box set. However, all agreed that a box set of SMiLE Sessions would be most welcome (as would a DVD of SMiLE live)! Surprisingly, there was very little talk about SMiLE line-up preferences and what songs to include/exclude. And the discussion was not limited to just SMiLE. I was captivated as some of the older participants at the event recalled stories of seeing the Beach Boys live in the early '70s, before they became the Surf song/car song Frankenstein that was the Beach Boys touring entity after 1976. I caught the tail end of one discussion about the "5 worst Beach Boys songs." About an hour after the event started, we gave away our 'door prizes', consisting of: several copies of the Project SMiLE CD-Rom, a 'commemorative' SMiLE music CDR, a SMiLE video collection (the SMiLE segments of "An American Band", "A&E Bio: Brian Wilson" and "Endless Harmony") and full-size SMiLE album cover slicks. Instead of a SMiLE-trivia contest to determine the prizes, we had a simple drawing. Since there was a good ratio between attendees and prizes, just about everyone walked away with something. We simply drew numbers, and if your name was called, you got to determine your prize from the "prize box". Unfortunately, we didn't get a group picture until about halfway through the event, so about 6-8 people were left out of the picture. Those in the picture included: Steve Shattah, Keith Lee, Tom Ekwurtzel, Ray Taylor, Jez Graham, Bill Graham, Jim Gray, Jon Kiger and Ronnie Dannelley. Although most of the fans that attended were older males, there were some females (for some reason, SMiLE seems to be a predominately male-oriented fascination). And, the coolest thing was the young and curious fans - who were given a quick 'intro class' by any number of us SMiLE-fanatics who were more than happy to oblige! One customer of the store actually walked in to pickup something else...and before he left, he had won a CDR music 'copy' of SMiLE. He seemed to be genuinely curious, asking, "Was SMiLE released?" I gave him the Reader's Digest version of events and we exchanged e-mails. All in all, the ASG was a success and I'm happy to say that everyone walked away happy (and with a little piece of SMiLE memorabilia). 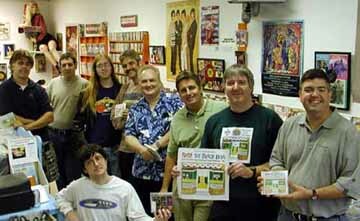 We all agreed that we would do this again in 2004 if the album (or box set) is released officially.